MADRID, Spain (CNN) -- A Spanish court convicted four men Tuesday but acquitted 10 others of charges that they helped four suspects from the Madrid train bombings to flee. 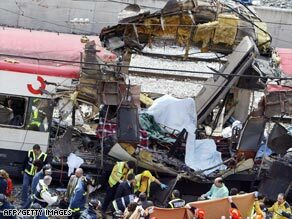 The rush-hour train bombings killed 191 people and wounded 1,800 others. The National Court convicted Kamal Ahbar, 31, of Algeria, and Samir Tahtah, 32, of Morocco, of belonging to an Islamic terrorist group, and sentenced them to nine years in prison, according to a 136-page court ruling. The court also convicted Mohamed El Idrissi, 32, of Morocco, of collaborating with a terrorist group and sentenced him to five years. Tarek Hamed Hamu, 30, a Spaniard from Spain's enclave of Ceuta on Morocco's north coast, was convicted of document forgery and sentenced to two years. But 10 other men, from Morocco, Algeria or Spain's Ceuta, were acquitted. Most were arrested in June 2005, a year after the Madrid commuter train bombings in March 2004 that killed 191 people and wounded more than 1,800. In June 2005, police closed in on a rundown locale, the court said, in a Barcelona suburb, on suspicion it was a hive for Islamic terrorist recruitment, indoctrination and logistical support to move men to Iraq to fight against western forces there, including as suicide bombers. Prosecutors said the group helped four train bombing suspects flee. But one was later caught and convicted in Morocco; another was thought to have died in Iraq, while a third was among seven key train bomb suspects who blew themselves up in Madrid suburb as police closed in on their hideout a month after the train bombings.